Muslim preaching has been central in forming public opinion, building grassroots organizations, and developing leadership cadres for the wider Islamist agenda. 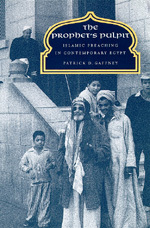 Based on in-depth field research in Egypt, Patrick Gaffney focuses on the preacher and the sermon as the single most important medium for propounding the message of Islam. He draws on social history, political commentary, and theological sources to reveal the subtle connections between religious rhetoric and political dissent. Many of the sermons discussed were given during the rise of Islamic fundamentalism, and Gaffney attempts to describe this militant movement and to compare it with official Islam. Finally, Gaffney presents examples of the sermons, so readers can better understand the full range of contemporary Islamic expression. Patrick D. Gaffney is Associate Professor of Anthropology at the University of Notre Dame.